What You THINK You Know About Back Pain Could Be Hurting You! When you're a healthcare provider, family and friends often ask you for advice about health issues. When I was visiting my parents, my dad asked me about some pain that he was having in his back and hip. Now, I haven't lived in the same city as my parents for over 15 years. My dad has mentioned some pain in his back and hip in the past, and he had some physical therapy for it several years ago, and it got better for awhile. He hadn't complained to me about it recently, so I didn't realize it was still bothering him. My parents have stayed active overall...they walk several miles nearly daily, go to the gym and lift weights and/or ride the elliptical several times per week, and stay involved in their community. However, my dad mentioned that in the past few months, he has had to stop squatting at the gym and instead switch to leg press due to his back and hip pain. He has strong legs and does just fine with the leg press, but when he would squat with even a small fraction of the weight, his back and hip would bother him afterwards. The pain had gotten to the point where he was experiencing nearly daily discomfort. The pain wasn't bad enough to go to the doctor about. However, he would complain to my mom (she was actually the one who brought the issue to my attention), but it wasn't aggravating him enough in his daily activities yet to REALLY seek treatment. So of course, I obliged the request to help my dad out, and as soon as I saw him standing, I had a good idea what the problem was. After watching him do a squat, I was sure what the problem was...because I see it all the time. In fact, it is probably the MOST COMMON CAUSE OF BACK PAIN that I see in my practice. He was standing with his back hyper-extended, and when he squatted, he was KEEPING his back extended. This puts the joints in your spine in a position where they are "jammed" together. Then if you throw additional weight on top of that, it jams them even more. When I asked him why he was doing that, he said because he didn't want to bend over because he was afraid that would put too much stress on his back and hurt it even more. When I asked WHY he believed that, he said "because you're supposed to keep your spine straight when you squat." 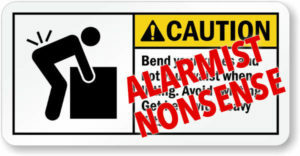 Numerous research studies have shown that the old "Lift with your legs, not with your back" adage is not only incorrect (most show that lifting technique is not a major risk factor for back pain), but that being TOO focused on how you lift may create excessive fear-related beliefs about back pain that lead you to moving in ways that are un-natural for your body (such as squatting with your spine in hyper-extension. As you can see from the video, just a small postural correction produced an immediate change in symptoms, even without any added weight! I get it... after all, it is my dad in the video. Of course my dad isn't going to say that what I did wasn't helpful. So, here's another video for you skeptics of what IS possible when you put your spine in the proper position with the proper muscle activation. Research shows that frequency of lifting, load of lifting, and depth of squatting are MORE related to higher spinal loading than to lifting technique, so doing things like this OFTEN is probably not the greatest idea. And you denifinitely need to have an appropriate amount of training in order to attempt doing thins like this. But, this just goes to show that your spine is STRONG, and it can do amazing things. But it's on you to make sure you use it the way that nature designed. And that's NOT THE SAME for every person...there are tall people and short people, thin people and thick people, and people with all different types of body structure. I believe there IS an ideal lifting posture for every person in a given situation...but that cannot possibly be the same for EVERY person, or even for different tasks with the same person. What we do at Movement 4 Life is help you to find the most ideal posture for YOU, given the specific goals and activities that you want to be able to do. If a muscle is sore, you should stretch it. 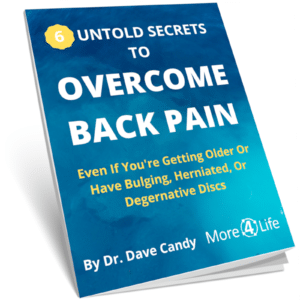 Learn the truths about back pain in our currently FREE E-Book, along with some simple tips and tricks you can use in your everyday life to help ease back pain without pain medication, injections, or even a trip to the doctor's office. Do You Have Any Nagging, Aching Pains That Have Lasted A Long Time? Perhaps there are some false beliefs that have been contributing to your symptoms as well. Even if the pain hasn't been bad enough yet to do anything about, we'd love to talk to you about your symptoms and see if some simple changes could help you live a happier, healthier, less painful life!